Post List Feature can now have normal content above the list. Menu Items can now be set to anchors (#block-wrap-123) to smooth scroll to elements on tfor any One Page </Sites. Check documentation for more info. 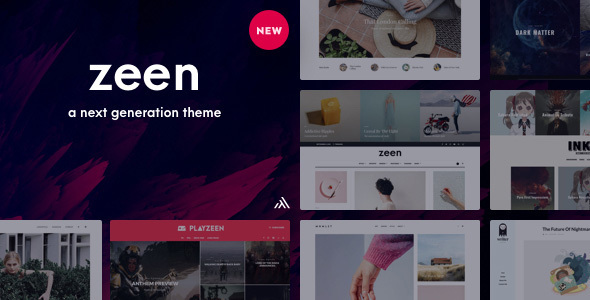 Zeen – Migration: Tool to migrate data from your previous theme. Currently for 15Zine athemes will be added to </the tool over time. - Theme Options - Posts: Autoplay on/off for certain Video/audio designs. - Theme Options - Global Options: Native Facebook Comments options (No plugins needed). - Theme Options - Custom Taxonomies: Options to set taxonomy defaults. - Tipi Builder: Ad Block: Now accepts pure AdSense code, no shortcodes needed. - Theme Options - Global Options - Global Colors: Load More Background color option. - Random Sort Option in archive pages (categories/tags/etc). - Tipi Builder New Filter - Custom Post Type Selectors. - Block Above Site specific posts ids can now be custom post type ids too. - Last Updated feature now loads on Infinite Autoload Posts. - Call To Action Block in columns styling. - Auto-middle of post content ad integration. - Theme Option - Posts: Show Updated Date. - Theme Option - Posts: Auto Dropcap. - Tipi Builder Buttons: Outline/Solid Option. - Video Post Design 4 video is now sticky if adjacent content is taller. - Mobile Bottom Sticky Social Bar updates button links when scrolling through auto loading posts. - YouTube video posts will now be processed via no-cookie domain (for GDPR). - Zeen Engine to v1.0.2. - Tipi Builder Call To Action Inside Columns issues. - Post Read more links. - Default text logo now working on all headers. - Standard menu dropdown not appearing on Post Custom Header.